A frontier family crosses the U.S. by wagon train, hoping for a better life in the Oregon Territory. In the year 1843, John Sager, a boy of 13 with his brothers and sisters including an infant set off on one of the most incredible journeys in American history. This is a true account of their hazardous 2000 mile trek along the legendary Oregon trail in pursuit of a dream. 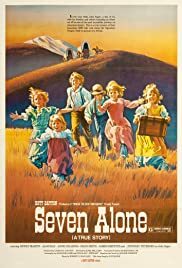 As one who grew up in Oregon and remembers reading in history about the Sager children on the Oregon Trail, this film has personal sentimental value. I agree completely with the other reviewer's comments regarding the flaws in this film. Yes, it does seem very low budget and amateurish, especially by today's standards. There are some fairly believable scenes here and there, but the true greatness of this film is in its historical value. The fact that this adventure profiles a family during the great migration on the Oregon trail, using real characters, not made-up ones, to do so is unique. It seems today's great epics, Titanic, Pearl Harbor, etc. tend to rely on fictional characters that pollute the authenticity of the real story. The irony is that real people are far more interesting and compelling as well as being more believable. The real Sager story is a great one and deserves a good telling using the best available. I'd like to see it attempted again with better writing, acting, and production. Unfortunately, Hollywood's recent track record for remakes is mixed at best and I wouldn't hold my breath expecting such a remake to be even as true to the facts as this one was. In spite of its flaws, this film is a must see for anyone wanting to know about the history of the Oregon Trail though films. Any collection of Oregon Trail related films will include it.